SIP delivers two important advantages over legacy switching. 1. SIP is based on open standards, so you can choose hardware and software that is best suited for your environment. 2. SIP’s capability extends beyond voice to new media types such as mobile, social media and video. 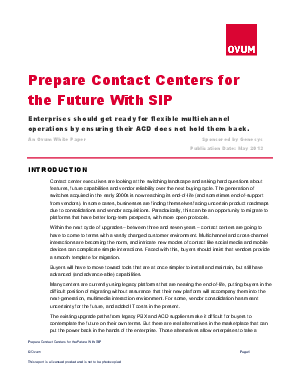 Read this whitepaper from Ovum to learn more about how to build the next-generation customer service platform.